Cities deal with lots of problems. There’s no question that an increasing number of cities must mitigate the issues that pertain to handling density, transportation, waste management, climate change and energy consumption. At any given time in an urban area, there’s tons of commotion happening all at the same time. People are running around, using transportation, gathering in public spaces, generating waste, straining the infrastructure, sitting in skyscrapers, taking selfies in front of the skylines, buying and selling things in markets and busy being humans. One could say it’s fairly chaotic. However, as some forward-thinking businesses know, there’s opportunity in chaos. The problems facing cities across the world vary both in scope and level of urgency. Indeed, the path to a sustainable future is through technology. Big payoffs can come to those pioneering cities of the future and working to solve real problems around hyper growth in urban areas. “We think that every city will be a platform upon which the tools of the metropolis will be built,” says Micah Kotch, Managing Director of Urban-X, a venture accelerator focused on Smart City Startups. 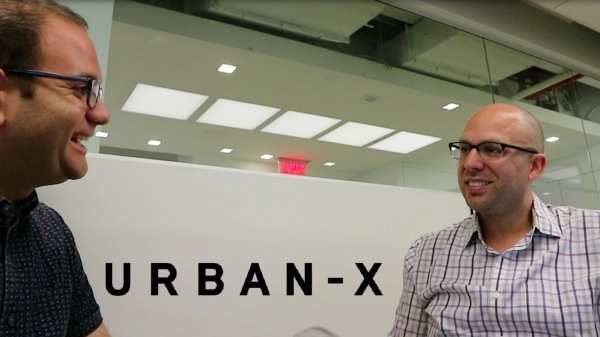 Urban-X is a new partnership between MINI and HAX (part of SOSV) to catalyze the operations, educate the founders, invest in the potential, and advocate for select startups shaping the future of cities through technology. The joint venture makes a lot of sense. MINI is a quintessentially urban brand with deep expertise in design, engineering, technology, and usability. HAX is the premier accelerator for hardware and connected devices startups. The prolific program has conducted accelerators in numerous cities like Boston, Shenzhen and San Francisco, and Schauernheim and manages around $250 million of assets. With this new initiative, together the firms support entrepreneurs who bring new solutions to market that are going to help improve people’s lives in cities. The first nine companies in the flagship cohort set out to tackle areas like big data and analytics for city planning, transportation, last-mile mobility, food waste, and urban agriculture issues. The problems that need solving are plentiful. The program offers massive value to the companies within the SOSV / MINI portfolio. What’s more beneficial than three months of intensive programming and mentorship, business development, and product engineering support from world-class designers and engineers at MINI and HAX? Throughout this program, the management team puts consistent effort into the portfolio companies. This is because they want to act quick and make a real impact. Not only do the accepted applicants receive a $60,000 seed capital investment with significant in-kind software, hosting, and legal services. The program brings deep experience to understanding hardware technology as HAX has some great services around helping with electrical system design and prototype development, understanding supply chains. MINI, too, brings top-notch engineering and design expertise. Entrepreneurial teams travel to Munich to spend time with engineers from MINI in Munich, and then and to Shenzhen, China, to understand what the process of bringing hardware products to market entails. Founders get an education in product development and industrial design. This 360-degree immersion provides access to the people in their network who are the industrial designers and embedded logical systems engineers building advanced systems. These individuals are spending day-to-day with the companies over the course of the four months. The mentors assist in thinking through all the different elements, the revenue model, value propositions, cost structures, partnership strategies, go to market strategies that are essential for startups to understand and get right. Further, Urban-X provides a strong ability to work in customer development by emphasizing the process of customer discovery, customer development, understanding customer acquisition costs and strategies, following “Get — Keep — Grow” strategies. They help build relationships with investors who understand this space. In some cases those are angels. In other cases, those are institutional sources of venture capital. Though, sometimes finding product market fit leads to pivoting as there can be big obstacles. “The solution to bring a new product to market is not always straightforward. In some cases, the channel is the city itself, the municipal government. In other situations, it is something like the local distribution utility. In some circumstances, it’s a big enterprise. Alternatively, there are cases where it might be direct-to-consumer. Each company has its own set of issues and logistics it must overcome to achieve product-market fit. Numina by CTY: is a business that provides real-time insights from streets for more responsive cities. Numina, CTY’s flagship product, is analytics for places. The product delivers real-time insights from streets using robust, wireless sensors pattern recognition technology. It counts measures movement of anything you can see. It then provides actionable insights for public safety and health, infrastructure design, commercial development, and multiple other applications. Farmshelf: creates modular urban farms that enable anyone to grow nutritious food with easy-to-use hydroponic urban farms for educational institutions, residential buildings, and under-utilized urban areas. Through its urban farming system customers can grow produce with minimal effort using a soilless culture. Industrial / Organic: changes the game by providing an efficient and sustainable landfill alternative which is designed to recycle organic waste. It is a mechanized system to recycle organic waste in facilities that are scalable and turnkey. Their first product is a microbial soil component which for use in agriculture. Its feedstock derived from a clean process that is low in both odor and emissions. Buzzware is a company working to create the infrastructure and a network for charging commercial drones. This sampling of firms demonstrates the variety of enterprises that are paving the way to industries of the future, as well as the future of big industry. Some industries that are ripe for scale and disruption include public safety and security, which is a major concern for modern cities; transportation and traffic management; food and urban agriculture; distributed energy solutions; and the need for resiliency in light of more extreme weather events. Success is of course not guaranteed, but new cottage industries and a wealth of new concepts get formed every day with technology advancing so rapidly. There are many permutations of how the market could react and if capital can foster the right companies. Within the project, many smart individuals are working to make the urban experience more tolerable and efficient. With an outstanding roster of talent from people who have commercialized technology, who brought new products to market, who worked in government, who sold to both the private sector and to the government — who are thinking about business model innovation in this space. The two organizations (Hax and MINI) obviously see urban areas as the new fertile ground for building companies, products, and services that will usher society into the future. Applications are open now for the second cohort, which kicks off in October. Founders can apply here by September 6th.